If you enjoy the excitement of not knowing the contents of a box but want something a little different than football cards, 2017 Leaf Autographed Football Jersey may scratch that itch. 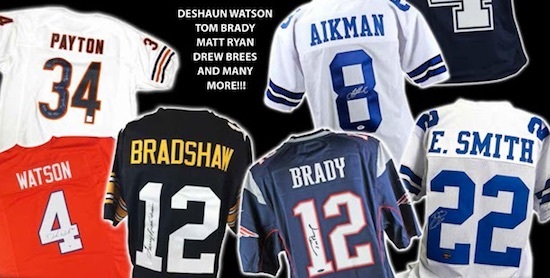 Every hobby box delivers one signed custom jersey. Just like the other memorabilia-based products in the Leaf lineup, 2017 Leaf Autographed Football Jersey brings collectors a blind-box format, in this case with an inked jersey waiting inside. The 2017 Leaf Autographed Football Jersey checklist looks at top incoming rookies, young breakout stars, current superstars and Hall of Fame legends. A snapshot of the key names can be seen below but this is by no means a full list of the possible jersey pulls. It is important to note that 2017 Leaf Autographed Football Jersey consists of custom jerseys. This means that they are not officially licensed NFL jerseys but still largely look the part.